Yesterday, I mentioned that Steve Solomon's health improved when he spent six months in Fiji eating nutrient-dense vegetables. The obvious question is --- why isn't all soil as good as the stuff in Fiji? When it comes to soil minerals, you need to understand both rocks and rain. The bedrock that slowly dissolved to make up the soil in your garden will determine which minerals were there to begin with --- some rocks are more well-rounded than others. But even if your rocks are perfect, lots of rain can still wash those nutrients out of the earth through a process known as leaching. Another factor to consider is age of your soil. Young soils have lots of minerals, but as soil ages, the rocks dissolve and stop adding extra nutrients to the soil. 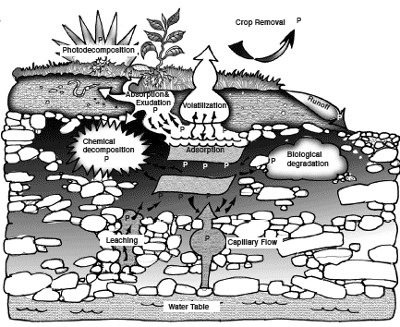 In addition, the cation exchange capacity of soils tend to degrade over geologic time. 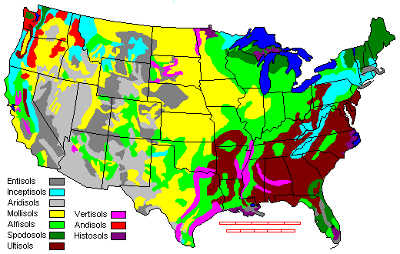 Here's where the southeast is even worse off than New England --- we haven't had glaciers down here recently to top off our rock reserves, so many soils are old and low on minerals. Assuming you aren't as lucky as folks in Fiji, you'll need to remineralize your soil to get it back in balance. This is why Solomon is down on the compost-cures-all-ills approach to gardening. As he explained: "Fertilizing a garden by composting local vegetation and animal manures derived from that same kind of vegetation will only magnify the regional soil imbalance." Time to get scientific and figure out exactly what your unique soil really needs. If you don't know what CEC is, I recommend starting your remineralization journey by reading my ebook on basic soil testing. I just started reading "gardening when it counts" by Steve Solomon. He made the same comments in that book as well. It does make sense that compost and even dynamic accumulators can't pull minerals that are missing to the surface. While I may not agree with him 100% he does make several really good points. Sometimes it takes hearing the same thing said in a different manner before it truly makes sense. You can use this site http://websoilsurvey.nrcs.usda.gov/app/ to get the soil survey for your plot of land, including some generalized soil chemistry & hydrology data. Love this post. No doubt learning your soils and why/how they got to be the way they are will help with proper management. One size does not fit all. Fiji-volcanoes-andisols-very young and fertile. But those soils have their management limits.